Southgate and his side are preparing for Saturday's clash with Sweden. MANAGER GARETH SOUTHGATE says England “might not have this opportunity again” as he plots a way past Sweden in the quarter-finals to a first World Cup semi-final appearance in three decades. Southgate said his team of youngsters led by Golden Boot contender Harry Kane “must make the most” of the way the cards have fallen for them in Russia. England’s penalty shootout win over Colombia in the last-16 means only Sweden stand between them and reaching the semi-finals for the first time since 1990. But despite all the euphoria generated back in England by his team’s progress, Southgate cautioned against getting too far ahead of themselves. 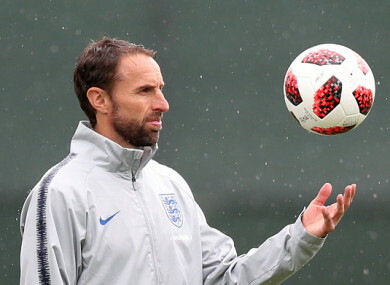 “You have to enjoy the good moments, but I am a long way from perfect, there are plenty of mistakes we have made while we have been here and we will make moving forward, so I think it is dangerous territory if we get carried away with things,” said Southgate. England face Sweden in Samara on Saturday, with the winner of that going on to play either Croatia or 2018 hosts Russia in the last four. Email “Southgate: England must make the most of World Cup draw”. Feedback on “Southgate: England must make the most of World Cup draw”.